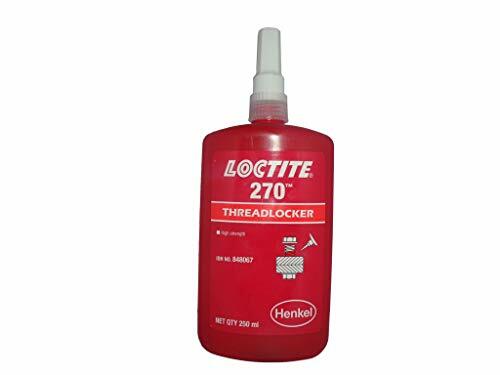 LOCTITE 270 is a high-strength threadlocker for maximum efficacy in the securing and sealing of bolts, nuts and studs to prevent loosening due to vibration. The product serves to permanently lock assemblies which must not come loose. It works on all metals, including passive substrates such as stainless steel, aluminium and plated surfaces. It is proven to be tolerant of minor contamination due to industrial oils, e.g. engine oils, corrosion prevention oils and cutting fluids. Can be disassembled by heating to 300°C. Storage Store in original containers at 8-210 C (46.4-69.8O F) and do not return residual materials to containers as contamination may reduce the shelf life of the bulk product. Application: 1. Clean all surfaces. 2. Use primer/activator for inactive substrate, large gap filling or low temperature cure. 3. Shake well before use. 4. Apply sufficient product onto the bolts at the nut engagement area. 5. Assemble and tighten as required. 6. Product cures in absence of air and presence of metal. Manufacturer: Henkel Adhesive Technologies India Pvt Ltd. Publisher: Henkel Adhesive Technologies India Pvt Ltd. Studio: Henkel Adhesive Technologies India Pvt Ltd.